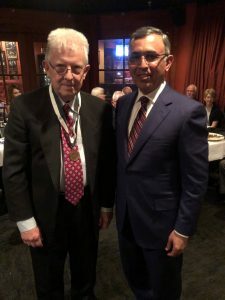 NEA Baptist is pleased to announce that on September 7th, 2018 , Dr. Michael Mackey MD, FACP, was named the Robert S Abernathy Laureate of the Arkansas Chapter of the American College of Physicians (ACP). The Laureate Award is a local chapter’s highest honor. The Laureate Awards honors Fellows and Masters of ACP who have demonstrated by their example and conduct an abiding commitment to excellence in medical care, education or research and in service to their community, their Chapter and the American College of Physicians. Dr. Mackey attended medical school at the University of Arkansas for Medical Sciences. He also completed his Internal Medicine residency and Nephrology Fellowship at UAMS. Dr. Mackey has been in practice with NEA Baptist for the past 40 years. He was the first nephrologist in Northeast Arkansas and initiated the first dialysis center in the region. Over the past four decades, Dr. Mackey has been actively involved in medical education, serving as Director of AHEC Northeast for 25 years and is presently the Director of NEA Baptist’s new Internal Medicine Residency program. 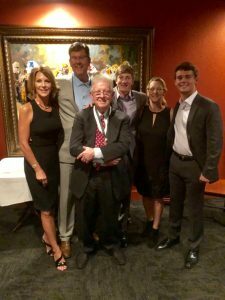 He continues the tradition of teaching and providing quality patient care thanks to his mentors Dr. Robert Abernathy, Dr. George Ackerman, Dr. William Flannigan, and Dr. Rodney Patterson. Dr. Mackey is a leader in local, state and national medical organizations and served as president of the Southern Medical Association from 2002-2003. Dr. Mackey continues the award winning tradition by joining previous Laureate Award winners: Dr. Robert Taylor, MD, FACP, Dr. Stephen Woodruff MD, FACP, and Dr. Ray Hall Jr. MD, FACP. NEA Baptist Health System comprises NEA Baptist Memorial Hospital, NEA Baptist Fowler Family Center for Cancer Care and NEA Baptist Clinic, northeast Arkansas’ largest physician group. The 228-bed hospital offers cancer care, heart care through the Heart Center, labor and delivery services through the hospital’s Women’s Center, as well as a number of inpatient and outpatient services, emergency care, and surgical services including weight loss surgery, neurology, respiratory care and pulmonary rehabilitation. NEA Baptist Clinic’s over 100 physicians practice in more than 35 specialties and offer a wealth of services, from pediatrics to orthopedic services. NEA Baptist was in the top 3% of hospitals in the nation in 2017 for receiving the Patient Experience Award and the Patient Safety Excellence Award from Healthgrades and the only hospital in northeast Arkansas awarded an ‘A’ for protecting patients from harm and meeting the highest safety standards set by Leapfrog Hospital Safety Grades. For more information about NEA Baptist, please call 870-936-1000 or 870-936-8000 or visit www.neabaptist.com or www.neabaptistclinic.com.